Eternity is on its way. Matt Kindt has done an excelent job with XO-Manowar (I have been eating that series up!). He is now turning toward what could be considered an even more ambitious project in Eternity. The powerful lost cosmonaut Divinity now heads deeper into the space and finds a new realm of Eternity. The world he finds is pretty out there, and this is Valiant really building up its own cosmic lore. Pretty typical from Valiant is their awesome art. Its almost hard to keep mentioning it as I just run out of adjectives for awesome. I do think I would through out that a lot of the artwork looks Kirbyesque for those versed in the ways of Jack Kirby that statement likely carries some punch. This is another limited series by Valiant and once again the company is making preordering the series the way to go. They through in a ton of extras to make it extra enticing and this also ensures that you can find these books. A lot of time Valiant books disapear Quick! See the press release below for more details. As revealed today at SyFy Wire, Valiant is proud to present the first look inside ETERNITY #1 (of 4) – the FIRST ISSUE of A VISIONARY NEW SERIES coming from the minds of New York Times best-selling writer Matt Kindt (X-O MANOWAR, Mind MGMT) and blockbuster artist Trevor Hairsine (DIVINITY, X-Men: Deadly Genesis)! On October 25th, a brand-new expedition into the unknown awaits… Beyond time… Beyond space… And beyond reality itself! At the farthest edge of all that is… Eternity awaits! On October 25th, go beyond the bounds and into Eternity itself as Matt Kindt and Trevor Hairsine witness the cosmic ignition of a fantastic new plane! 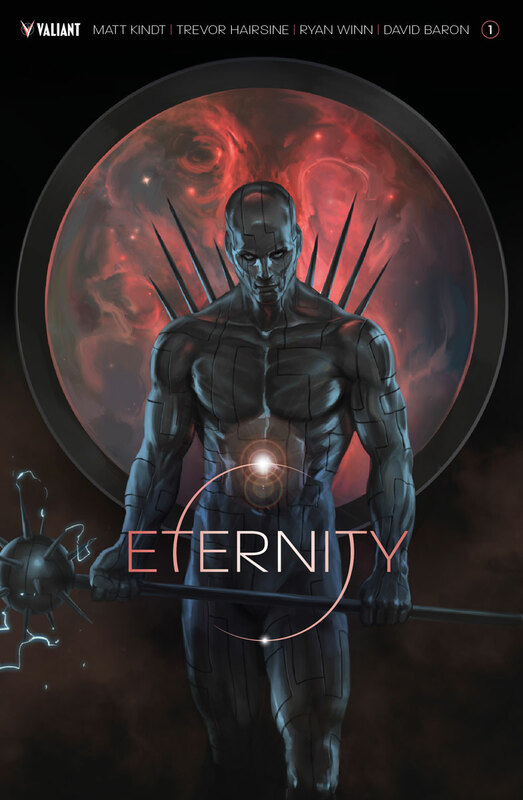 A new pantheon of good and evil awaits, only in ETERNITY #1 (of 4) – featuring transcendent covers by Jelena Kevic-Djurdjevic (FAITH), Tom Muller (DIVINITY), Trevor Hairsine (Ultimate Six), Matt Kindt (Dept. H) and Felipe Massafera (Shaper)! PLUS: Reserve your copies of Valiant’s visionary new adventure with the ETERNITY #1–4 PRE-ORDER EDITION BUNDLE – spanning all four issues of the must-read VALIANT PRESTIGE format limited series! Released monthly from October 2017 through January 2018, each PRE-ORDER EDITION comes packed with trade paperback-style extras and bonus content, including creator commentary, behind the- scenes looks at the creation of the comics, process character designs and artwork, and first looks at upcoming issues – plus an exclusive cover by interior artist Trevor Hairsine that can’t be found anywhere else! Toylab is a member of the Amazon Affiliate program and so we can bring you these awesome deals on Valiant products directly from Amazon to you. Valiant has great comics but they tend to sell out quickly in stores. Getting online or preordering through your local store is really the way to go.